The streets of 1893 New York are full of life: crowded, filthy, dangerous. If you are a newsboy like thirteen-year-old Maks Geless, you need to watch out for Bruno, leader of the Plug Ugly Gang whose shadowy, sinister boss is plotting to take control of all the newsies on the lower East Side. With Bruno’s boys in fierce pursuit, Maks discovers Willa, a strange girl who lives alone in an alley. It is she, stick in hand, who fights off the Plug Uglies—but further dangers await. Maks must find a way to free his sister Emma from The Tombs, the city jail where she has been imprisoned for stealing a watch at the glamorous new Waldorf Hotel. Maks, believing her innocent, has only four days to prove it. Fortunately, there is Bartleby Donck, the eccentric lawyer (among other employments) to guide Maks and Willa in the art of detection. Against a backdrop alive with the sights and sounds of tenement New York, Maks, as boy detective, must confront a teeming world of wealth and crime, while struggling against powerful forces threatening new immigrants and the fabric of family love. “An immigrant family tries to survive crime, poverty and corruption in 1893 New York City. "Earning enough money to cover the rent and basic needs in this year of economic panic is an endless struggle for every member of the family. Every penny counts, even the eight cents daily profit 13-year-old Maks earns by selling newspapers. Maks also must cope with violent attacks by a street gang and its vicious leader, who in turn is being manipulated by someone even more powerful. Now Maks’ sister has been wrongly arrested for stealing a watch at her job in the glamorous Waldorf Hotel and is in the notorious Tombs prison awaiting trial. How will they prove her innocence? Maks finds help and friendship from Willa, a homeless street urchin, and Bartleby Donck, an eccentric lawyer. 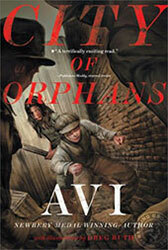 Avi’s vivid recreation of the sights and sounds of that time and place is spot on, masterfully weaving accurate historical details with Maks’ experiences as he encounters the city of sunshine and shadow. An omniscient narrator speaks directly to readers, establishing an immediacy that allows them to feel the characters’ fears and worries and hopes.